Gary and Diane are operating a very successful police and collector badge business from the comfort of their home office. 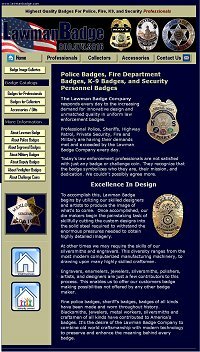 The news of Lawman Badge’s product quality and, unparalleled friendly service, is well known in their niche market community. Gary and Diane came to me back in 2003 originally to help them freshen up the look of their existing Web site. We also added some new features for their shopping cart and helped them gain better positions in popular search engines such as Google. Contact webmaster@workfromhomesystems.com with comments or questions regarding this site. © Copyright, workfromhomesystems.com, All rights reserved.